Blizzard Entertainment has a long line of releases with serious stories, usually focusing on the fate of the world or racial warfare. The Warcraft franchise has a few nods to comedy here and there with creatures like the Murlocs and the Pandaren, but for the most part, big bads like the Lich King still run the show. Comparatively, Hearthstone: Heroes of Warcraft (Free) is a card game where you can summon an angry chicken and peck your enemies to death. As you can imagine, it’s a ton of fun. 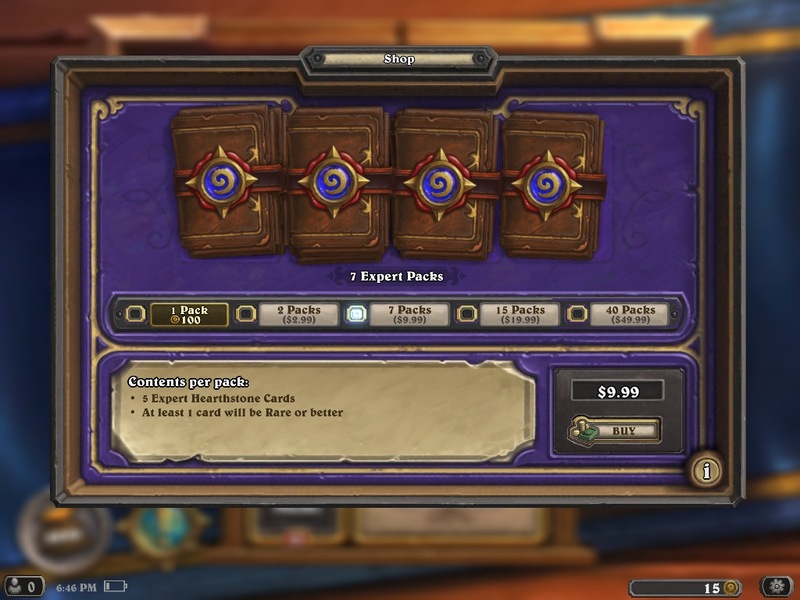 Let’s start with the giant elephant in the room — Hearthstone is free-to-play. Don’t get your pitchforks out just yet though, because after hours upon hours of play, I’m pleased to report that it isn’t pay-to-win in the slightest, nor does it withhold content in favor of a pay-gate. For starters, cards can be earned simply by playing the game, and leveling up any one of the game’s nine classes (Warrior, Shaman, Rogue, Paladin, Hunter, Druid, Warlock, Mage, and Priest). Early on you’ll earn class specific cards very quickly, as well as a number of general cards that can be used with any deck. You’ll earn XP with each type and after a specific level, you’ll start earning “expert packs," which is basically code for random cards. There are also quests to complete along the way that earn you coins, which in turn can be used to purchase packs for 100 in-game currency, and enter the Arena (more on that later). If you really want to pony up some cash, you can buy packs piecemeal by way of IAP. Having said all that, I haven’t spent one dime and I feel like I have more cards than I know what to do with. The game has gone through a monumental amount of balancing since its beta phase, and any player can craft a deck worth competing with based on the cards you get for free. The actual game is super easy to pick up, especially if you’ve played a game similar to Magic: The Gathering. 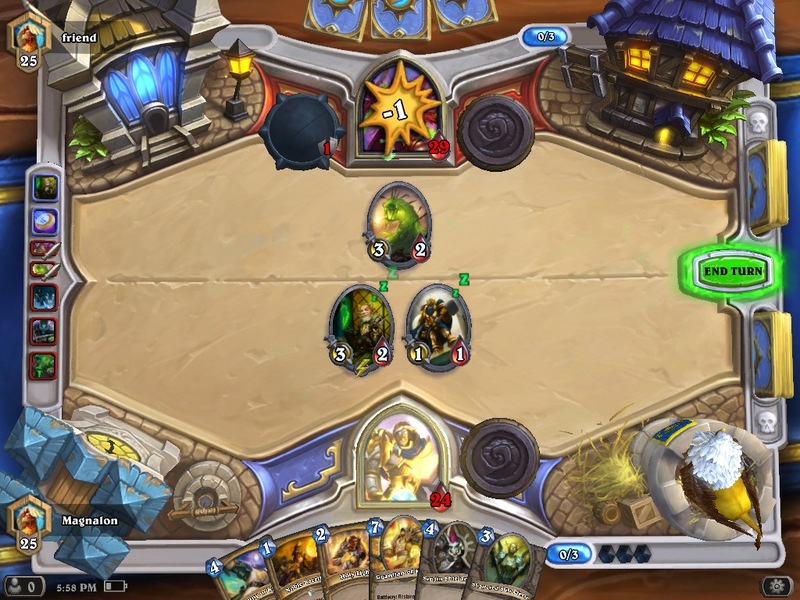 Hearthstone is strictly a one-on-one affair, with one deck for each player. A digital coin is flipped, and the starting player begins the game with three cards and 1/1 mana — the second player starts with four cards and a “coin" card that allows them to gain an extra mana, as well as the same 1/1 standard — to make up for going second. Mana goes up by one maximum allotment per turn, and is essentially the resource that allows you to play cards. Weaker cards generally cost less mana, and stronger cards tend to be around the maximum range of 10 mana (although there are exceptions and cards that can modify your mana pool). This basically allows for a ramped up style of play, where matches begin fairly quietly, but evolve into dangerous games with lots of high-powered cards. As a result, rounds tend to not drag on, which is a good thing. Your ultimate objective is to “kill" the other player, who sports 30 life points. Players can be damaged in lots of ways, including minion attacks (that have an attack and life value, and can’t attack the turn they’re summoned), spells, hero powers (which vary from character to character) and other ancillary cards. It’s your job to decide what cards to play, and what strategy to employ on any given game. For instance, you may start the round with two minion cards that only cost one mana. On your second turn with two mana, you can bring out both of those minions on the board, or use a two mana card that instantly does three damage to your opponent. Not bringing out minions could come back to bite you later on, and using the instant damage card early could be a mistake as well. Hearthstone is a game of constant give and take, and it’s that strategic depth that really makes it something special. Because of how many variables are in tow (cards that can attack instantly, cards that can create invincible shields good for one hit, and so on), every single game is utterly different, and every opponent will likely use a new strategy. It keeps the game fresh and entertaining for hours on end, especially when coupled with the portable nature of the iPad. So about those game modes. 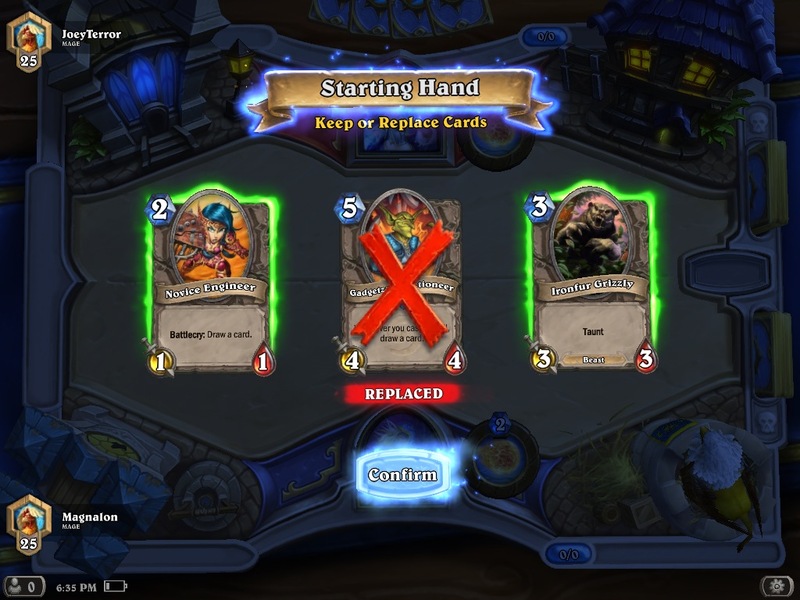 In Hearthstone you can play normal games online via matchmaking (unranked or ranked), practice against AI, play head-to-head with friends, or go at it in the arena. While all of the other modes are self-explanatory, the arena is the meat of the game for many competitive players. For a gold fee (or an unneeded IAP), you can enter a special set of matches that lets you play until you lose three rounds. The catch? You need to select a new deck after each death, and craft it around pre-ordained cards from a giant pool. It’s similar to playing closed deck Magic games, in that you can’t rely on the same strategy or deck every time. Arena is really tense, and easily the highlight of the game as it encourages you to learn how to use a multitude of cards as well as win indefinitely. When you finally are brought down you’ll earn a new pack of cards based on how well you did. Then you’ll need to pay up again before you re-enter. It’s a fair system that encourages you to work for it, so it’s a good thing the game is fun to play in general. In terms of the iPad controls specifically, Hearthstone works like a charm. All you have to do is hover over a card to read the text, tap a card to select it, or drag it to play it or move it around. Tiny inconsequential environmental effects can also trigger when touching around the map, simulating a mouse cursor click. On an iPad Mini I haven’t encountered one game with any significant amount of lag or framerate drops. 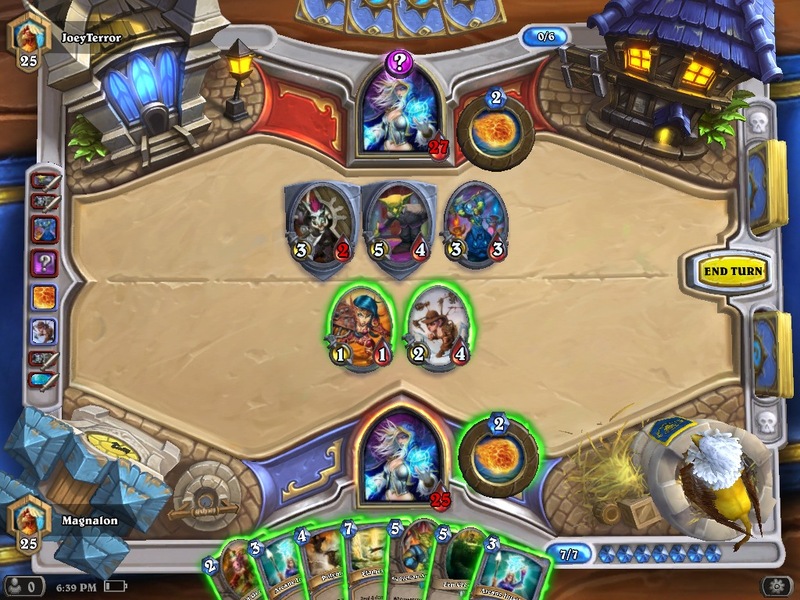 For Blizzard’s first major iPad port, Hearthstone is a resounding success. I should also note that it’s cross-platform compatible as well, in addition to the fact that you get an extra deck just for logging into your account on an iPad — so you aren’t missing out on anything compared to the PC and Mac versions since it all runs off Blizzard’s backend servers. It’s also stunning on a visual level, sporting a beautiful art style that shines on the iPad just as well as it does on other platforms. The amount of art in this game is staggering, as no two cards look alike, and each effect has its own unique animation or sound. Hearthstone is not only an example of a free-to-play model done right, but it’s a must-play for card game enthusiasts everywhere. It’s incredibly easy to get into, the picturesque art is easy on the eyes, and best of all — it plays perfectly on an iPad.